To celebrate holidays with sporting events was a long-standing tradition in Ontario. OHW celebrations followed this practice as well. 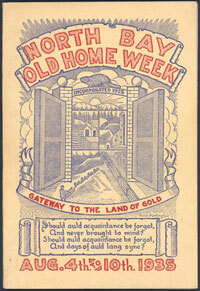 In 1925 the finance committee of Old Home Week was allocated $4000 to spend on recreational sports during the August celebration. 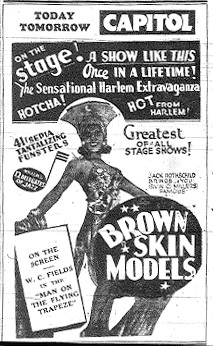 A wide range of events were planned that would appeal to almost everyone including soccer games, baseball, swimming, football, track events, tennis, and quoits. Sporting events took place at several locations. Amelia Park beach was the site of canoe races, swimming and other water events such as log burling. Wallace Park and Amelia Park were used for baseball, softball, ladies’ softball, and track events for young and old. Lacrosse and baseball played by the Old Timers were major attractions. Lacrosse used to be very popular in North Bay before World War One. Former members of the North Bay lacrosse team met in July to organize for a game against Sudbury during Old Home Week. Mattawa also pulled together a team. Those who played baseball were former North Bay baseball club players, some from as far back as 1884. The tennis tournament was extremely popular and entries from many parts of Northern Ontario including Timmins, Haileybury, Sudbury, Copper Cliff and Cobalt were received. As a result of the enthusiasm, the North Bay Tennis Club decided to establish an annual Northern Ontario championship. In 1935, horse racing was no longer the chief attraction at OHW. In fact, the track was gone, having become the grounds for North Bay College. Key attractions included the marathon swimmer Marvin Nelson, and a baseball game played by NHL players. (See Special Events.) Another high profile event was a boxing match between Dom Scappatura and visiting Kirkland Lake boxer Herbie Dymond held at Wallace park. Having grown up in North Bay, Scappatura had many local fans and they turned out in large number to watch him fight. This was only one of several matches that took place with local boxers participating. OHW was an opportunity to bring in some of the best teams in the region. A baseball game between Kirkland Lake and Frood Mine, for example, was expected to one of the most entertaining events of the week as the Kirkland Lake team had not lost a game yet and Frood Mine was considered to be one the best teams in their league. Games which featured Old Timers were also crowd pleasers. As expected, large crowds turned up to watch Old Time baseballers including “Boxcar McDonald”, “Gutty” Lockhart, and “Cap” Weegar in a challenge game against the CPR Ceepees. 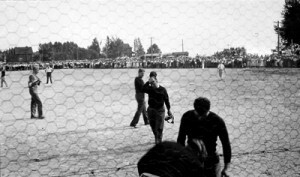 A photo (left) of a baseball game in 1935 suggests that large crowds watched some of the games. Lacrosse was no longer played on a regular basis but was revived for OHW. 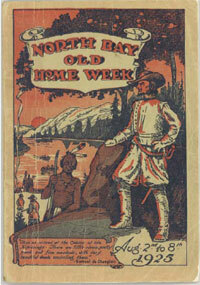 North Bay was defeated by Sundridge despite the help of Native players from the reserve. Regular teams also got an opportunity to play during the week. The North Bay Rosedale Thistles, for example, played soccer against the Garson Mine team in front of a crowd of 1500. Veteran soccer players also pitted themselves against younger players. The T&NO baseball team lost shamefully to a Pembroke team. Local girls’ softball team and younger players also got a chance to play. Track and field events, bicycle races, and swimming races provided the greatest opportunity for local children to participate in the events of the week. Both the Motor Club and the Knights of Columbus included a number of these activities in their program. The Motor Club held swimming and running races in the morning at Amelia Park. Local athletes, ranging from as early as 15 years of age to adults were able to take part in the races. 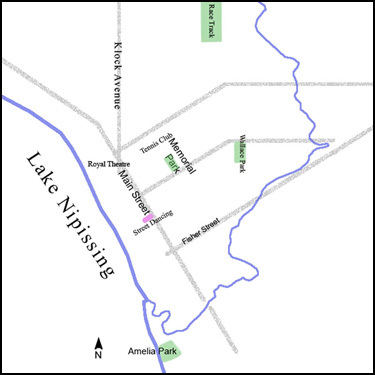 For the swimming portion, the competition took the form of a quarter-mile race in Lake Nipissing. Sporting activities during the OHW celebrations were similar to those of Dominion Day and Victoria Day holidays and of company or church picnics. During the celebrations regular play was suspended and exhibition and novelty games were the norm. The focus could be on providing a high quality games that people would want to see or on hilarity and entertainment. 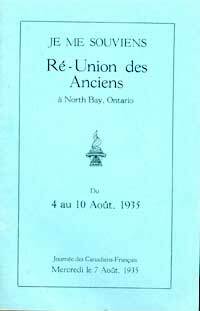 This entry was posted in Celebrations, Community History, Sports and tagged North Bay, Old Home Week on February 2, 2013 by Françoise Noël. In 1925, the big entertainment special event was an act by James Hardy, a high wire walker and stunt man, advertised as “The only living ‘Hero of Niagara Falls'”, the ‘Marvel of Genesse Gorge’ and the ‘Wonder of Montmorency Falls’. ‘The World’s Famous Aerial Artist’ performed daily at Wallace Park with a special show for Children’s Day. During his act he changed clothes and balanced on a bicycle. A huge concert with about 700 school children was another special event held during OHW. It was under the direction of J. Gatenby and held at the arena. Hockey was by far the most popular sport in North Bay and some local players had gone on to the National Hockey League. In an era of natural ice, a summer event like OHW did not allow for a hockey match. But even without a hockey game, these players would be a draw. They were brought in to play softball against a local team. The match which pitted fourteen NHL professional hockey players against the North Bay Travellers and gave spectators a chance to meet and greet these hockey players drew a crowd of 4,000 to Amelia Park on Saturday afternoon. The results of the game, a defeat of the Travellers by a score of 11-10 was probably not as important as the chance to see the hockey stars in person. 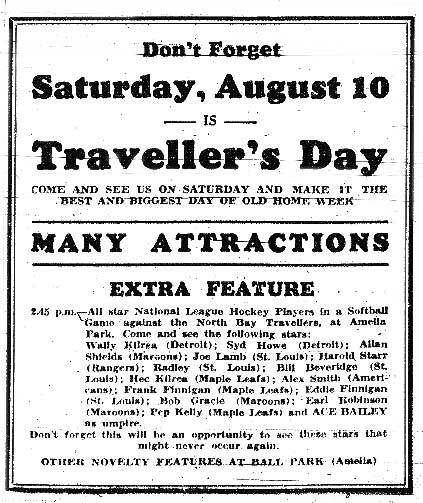 Traveller’s Day with this special feature was advertised well in advance. The ad to the left and the program listed the hockey stars who were coming: Pep Kelly, Maple Leafs; Bob Gracie, Maroons; Hec Kilrea, Maple Leafs; Wally Kilrea, Detroit; Syd Howe, Detroit; Allan Shields, Maroons; Joe Lamb, St. Louis; Bill Beveridge, St. Louis; Alex Smith, Americans; Frank Finnegan, Maple Leafs; Eddie Finnegan, St. Louis; Earl Robinson, Maroons; and, Ace Bailey, “former star of the Toronto Maple Leafs and one of the most popular stars of all time” as umpire. 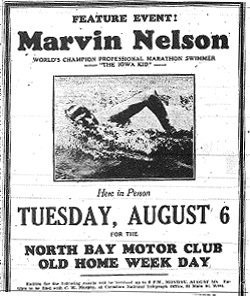 Marathon swimmer Marvin Nelson was a star attraction at the 1935 OHW in North Bay. According to the advance publicity for the event, Nelson was world champion swimmer five times over. His first win of the unofficial world champion title was in 1930 in Toronto at the Canadian National Exhibition. Three years later, he won again, the first person to do so twice, to a crowd of more than 100,000. In North Bay the crowd was much smaller, but Nelson not only performed, he also considered coming back again. This entry was posted in Celebrations, Community History and tagged North Bay, Old Home Week on February 2, 2013 by Françoise Noël.